1. 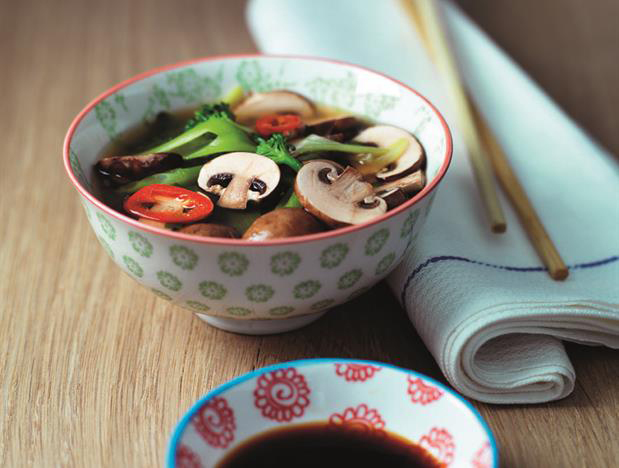 Heat the vegetable stock or miso stock in a large saucepan until simmering, then add the mushrooms, spring onions, broccoli and chilli. 2. Simmer for 10-15 minutes, then add the coriander. 3. Season to taste with soy sauce (or use a little salt and pepper), then serve. Cook’s tip: To make the soup more filling, add a sachet of pre-cooked (ready-to-wok) noodles just before serving. *You can buy miso soup paste at most supermarkets – just follow the pack guidelines to make up 1 litre.